A U.S. journalist imprisoned in Iran has stopped her hunger strike after more than two weeks, her father said Wednesday. Roxana Saberi, 32, had been drinking water but eating no food in protest at her detention at Tehran’s Evin prison, according to her father, Reza Saberi. Officials had brought her to the hospital Friday and fed her intravenously before returning her to her cell, her father said. Roxana Saberi stopped her hunger strike Monday night after both parents visited her in prison and pleaded with her to end it, Reza Saberi told CNN. In an e-mail sent Wednesday morning to supporters, Saberi said, “We were very glad to hear this news. We hope she will gain some strength to enable her to stand the appeal trial. She thanks all those who have supported her with their hunger strike all over the world.” The hunger strike began the week of April 21, Reza Saberi told journalists last week. The Iranian-American journalist was tried and convicted on espionage charges in a one-day trial last month that was closed to the public. She was sentenced to eight years in prison. Saberi is appealing her verdict, and Iranian authorities have said they will make sure her appeals process is quick and fair. Reza Saberi said the family is looking forward to the appeals process, expected to begin next week. But he told CNN, “We do not know what to expect. We just have to wait and see.” Roxana Saberi launched her hunger strike to protest her confinement at Evin, which houses many Iranian dissidents and political prisoners. Iran’s attorney general, Hojjatoleslam Dorri Najafabadi, said last month that Saberi’s case “will go through its legal process like other cases,” according to Iran’s unofficial Shahab news Web site. He also said the initial verdict is not final and could be changed by the court of appeals, Shahab reported. Saberi’s case has prompted sharp denunciations from U.S. President Barack Obama, as well as other U.S. and international officials. Iranian officials initially said Saberi was held for buying a bottle of wine. The Foreign Ministry later said she was detained for reporting without proper credentials. Saberi has been living in Iran since 2003, according to the Committee to Protect Journalists (CPJ), a journalists’ advocacy group. 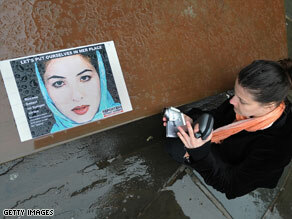 She has freelanced for National Public Radio and other news organizations and was writing a book about Iranian culture. Iranian authorities revoked her press credentials in 2006, but Saberi continued to file short news items with permission from the government, CPJ said. Her reports were reviewed by a government minder, which is common practice in Iran, CPJ spokeswoman Meredith Greene Megaw said. Saberi was detained in January, although no formal charges were disclosed. On April 9, word emerged that she had been charged with espionage. “Without press credentials and under the name of being a reporter, she was carrying out espionage activities,” Hassan Haddad, a deputy public prosecutor, told the Iranian Students News Agency. Authorities also said Saberi had confessed. Her father has said he thinks she was coerced into making damaging statements. Shirin Ebadi, an Iranian human rights activist, has joined Saberi’s legal team. Ebadi won the Nobel Peace Prize in 2003.